The launching of the European Cup 2011 in Selbu appeared in lovely sunshine. As even the Weather Gods had fulfilled their obligations, it was obvious that the implementation of the Cup had to be a success. And, indeed it was! Under the resolute and competent leadership of the Trial Manager Curt-Christer Gustafsson, assisted by Secretary Henry Gullans, the European Cup 2011 was brought safely into port. 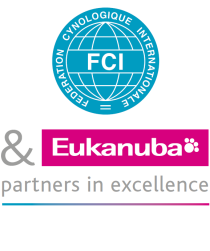 First item on the agenda was the meeting of the FCI Commission for Hounds of the 6th Group. Followed by the judges’ meeting. The European Cup is a very solemn event. 18 teams from seven countries were one by one led up to the podium by young ladies in national costumes carrying the flag of the individual country, and applauded by an enthusiastic audience. On the podium the national anthems were played and the flags placed as flagpoles at the back. A very dignified seance. The European Cup 2011 was won by the Lucerne Hound “Erika von Weishorn”, owner : Walter Jäger, Switzerland. Second and third prizes went to Norway, respectively to the Dunker “Bs-Ms-Rita”, owners : Birger Steen / Tore Hellingsrud and to the Hygenhund “SE King”, owner : Roy Dramstad. Both the Dunker and the Hygenhund are among the Norwegian Hound breeds where the Norwegian Kennel Club has taken important steps in order to increase the registration numbers, thus ensuring their future. We received the very best hospitality and catering at the Selbu hotel, and every successful hunting trial must be rounded up with a Hunter Dinner. The main dish with lamb shank was excellent, and the dessert likewise. Admirable were also the many speeches, and the atmosphere at the tables. Curt-Christer Gustafsson expressed in a clear voice and diction worthy of a retired Colonel ; indeed, this has been an outstanding arrangement, probably one of the best I ever attended! THC’s oldest honorary member, Mr Sverre Dragsten, was equally clear. In a moving speech, carried out in excellent English, he rounded up the many speeches saying “I am proud to be a member of the Trøndelag Hound Club”. Please find the complete coverage of the European Cup 2011 on our site: http://www.thhk.no/Europa/Cup/Cup.html with links to all ceremonies.